Une soirée de conversation - part deux! Fluent or beginner - like to talk or just listen - everyone is welcome. Come for conversation, wine and light hors d'oeuvre on Wednesday April 25 from 6:30 to 8:00 pm. Just before Easter, I had the pleasure of spending four days in Brittany, the northwest section of France. As with all of France’s regions, Brittany is almost a country within a country. It wasn’t until 1532 that the Duchy of Brittany was permanently reunited with France. Brittany is known as Breiz in Breton (a Celtic language). While few people still speak Breton, street signs and place names are in both Breton and French and many of the traditional songs are performed in Breton. The weather and the beautiful and rugged scenery also has more in common with Ireland than southern France. Cancale—a picturesque fishing village famous for its oyster “farming”. On a clear day, you can see the outline of Mont St. Michel. Food is important in every region; besides oysters, another specialty is Breton butter cookies. If you want to have a “hands on” experience, I suggest taking the class at la Maison Guella (located just on the outskirts of Cancale). You can learn to make the type of Breton butter biscuits known as le palet Breton. After making them in the class, your biscuits are boxed up to take with you. These are almost more like a buttery biscotti vs. other types of Breton biscuits that are equally delicious but taste more like Scottish shortbread. No trip to Brittany is complete without one lunch or dinner at a crêperie. At La crêperie Breizh Café in Cancale you can watch the chef preparing traditional sarrasin (buckwheat) crêpes. These delicious crêpes can be filled with a huge variety of toppings accompanied by traditional cidre (cider) from Brittany or Normandy. St. Malo and Dinan—are two other charming towns with fabulous views, fortified walls and winding medieval streets. Much of St. Malo was burned in August 1944 (one of our former AF book club reads was the 2015 Pulitzer Prize winner, All the Light We Cannot See takes place in St. Malo). The town was lovingly restored after the war. My visit to Dinan was far too short—but there was time for a wonderful dinner of beautifully prepared local specialties at the highly recommended Restaurant Les 3 Lunes. Golfe du Morbihan—A cruise with Vedettes Angelus is a great way to see this area which has about forty islands—some of them inhabited. Carnac—With a total of over 3,000 menhirs dating from 4,000 BC, this is a “must see”. There are three impressive megalithic sites-the Alignments of Carnac, Megaliths of Locmariquer and the Grand Cairn of Barnenez. Vannes—Known as a “City of Art and History”, this is a true gem along the Golfe du Morbihan. There is a charming harbor, medieval ramparts and half-timbered houses (and great shopping). This is the perfect city to use as your base for exploring this area. When you are ready to go back to Paris, the TGV from Vannes is only 2 ½ hours. How well do you know Paris? Today we look at the 16th arrondissement. 1. How many lakes are in the Bois de Boulogne? 2. In what year was a gilded bronze flame placed n the place de l’Alma? A. 1934, on the occasion of the 50th anniversary of the Statue of Liberty. B. 1987, for the centenary of the International herald Tribune. C. 1998, one year exactly accident in the tunnel that killed Princess Diana. 3. What memory does the word Trocadéro evoke? A. The taking of an Andalusian fort. B. A battle won by Napoleon’s army in a Piedmontese valley. C. The name of the architect who built the palace (since demolished) for th 1878 world’s Fair. 4. What 624-square-meter painting occupies a whole room of the Museum of Modern Art of the City of Paris? A. Claude Monet’s Water Lilies. B. Henri Matisse’s The Danse. C. Raoul Dufy’s The Electric Fairy. 5. What country is particularly favored in the place names of the 16th arr.? Answers can be found at the end of the newsletter. Answers: 1. B, 2 lakes linked by a waterfall; 2. B, 1987; 3. A, a fort situated near Cadiz, Spain; 4. C, The Electric Fairy; 5. B, the US. One more night in the environs of Paris: Dan and I are stopping overnight near the Charles De Gaulle‎ airport on our way home from Crete. Once, years ago, I did the same, but my hotel was on the other side of the airport. Then, I was delighted to find myself near an old village, half-decayed, half alive, in which to walk and look at small, ancient houses of stone next to barns with collapsing roofs, old hay still in them, as well as spruce, newer houses with geraniums in the window, and around it fields being plowed. There was a restaurant there, too, that looked good. I believe I've finally recovered the name of the village: Le Mesnil-‎Amelot, and I hope to stay there next go-around to see how things are now. This time, though, we stayed very near the "Centre Ville"of Roissy-en-France, at the Marriott. I love finding a village or town within walking distance to explore ‎while staying near the airport. We crossed the street next to the hotel and entered a park where trees were in pink bloom, a thrush was singing, and then came upon several streets with interesting houses and gardens, even a remaining ancient wall of the now-destroyed chateau Roissy's stable, to admire. We spied a few bistros, too, and wished we'd known of them before we dined at the hotel. Not that we were displeased with our dinner at the airport Marriott-it didn't offer the "Pigeon Rouennais" we marvelled over at the restaurant Gill in Rouen- but a delicately piquant boeuf tartare with crisp, hot pommes frites and lightly dressed salad was to be had. We felt very fortunate. Now we're on the plane home. Nine cooped-up hours to experience. The excellent French bread didn't make it on to the flight.‎ Alors, we have home to look forward to. How well do you know Paris? Today we look at the 15th arrondissement. 1. Like all of Paris’s arrondissements, the 15th consists of four quarters, which are: Necker, Grenelle, Javel and. . .
2. The sculptor Bourdelle has his museum on the rue Antoine-Bourdelle. He had people call him Antoine rather than his given name Émile. Why? A. Out of admiration for Antoine Rodin, who he considered his teacher. B. Because he hated the nickname Mimile. C. Because his wife’s name was Cléopâtre. 3. At 91 rue Lecourbe a minuscule Russian church is hidden at the rear of a backyard. What natural wonder is found inside this place of worship? A. A tree trunk, planted in the ground, that shoots through the roof of the church. C. Interior walls covered in ivy. 4. What contemporary artist is the creator of l’Oiseau lunaire, a 2m—high bronze sculpture placed in the center of the square Blomet? 5. Where does the name of the Bir-Hakeim metro station come from? A. From an Arabic form of address. B. From the headgear worn by French colonial troops. C. From an oasis in the middle of the Libyan desert. Answers: 1. A, Saint-Lambert quarter; 2. because of his wife’s name Cleopatra; he was the assistant of Auguste (not Antoine) Rodin; 3. A, two trees are in the church, one is thriving, the other is a trunk; 4. Joan Miró; 5. C, named in memory of a battle fought at this oasis in the Libyan desert in 1942. An early-spring day in Rouen, Normandy this Monday, March 26: Sun lighting up the stunning stone lacework that is ‎the front facade of Rouen's cathedral, neatly planted yellow and purple pansies and crocuses in a municipal flower, and, moments later, pavement cobblestones dark with rain. More rain was predicted for the following day, but that didn't stop Dan and I from driving to Honfleur, an extremely attractive coastal town. Because Easter was approaching, one saw Easter bunnies everywhere in Honfleur: in ceramic, painted in the faïence style of Rouen, in chocolate, in pastry, in antique shop windows and "Joyeux Pacques" signs in the shop windows. A rainy day is a good day for taking a driving tour along the meandering Seine from Honfleur, especially when the wonderful Musée des Beaux Art of Rouen is closed (aargh). Using secondary roads through the valleys and plateaus along that wide green river, we saw moss-painted villages, tall trees hung with balls of mistletoe, the greenest grass one could ever see, and, between Azier and Hauville, many fields headed with big piles of cow manure waiting to be spread on them. Not many apple trees in bloom yet. 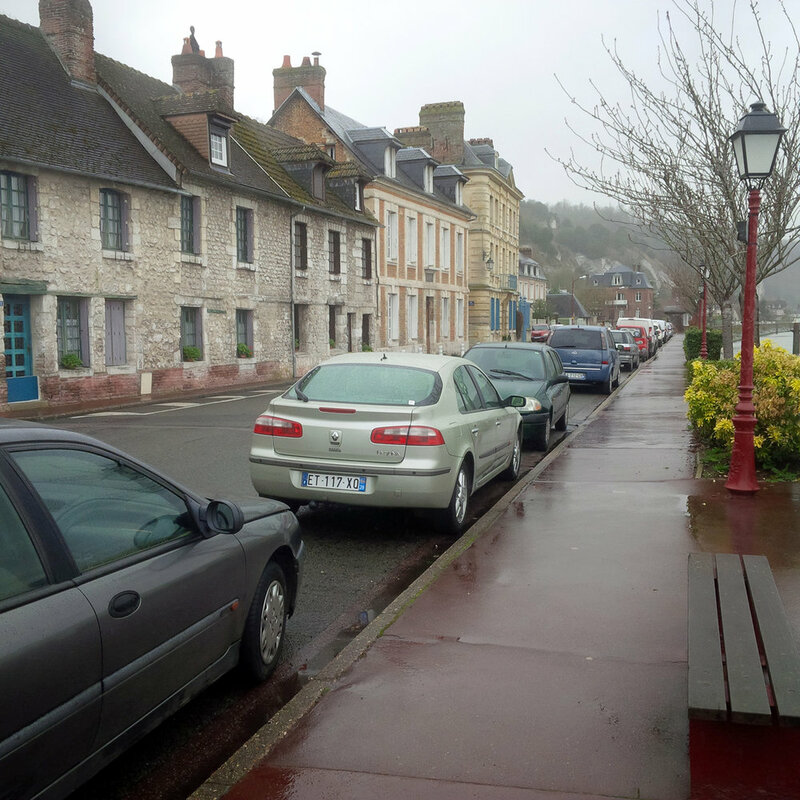 At La Bouille we wound down the steep road to the promenade along the Seine, hoping to have tea on a terrace, but as the photos show you, the weather discouraged it-no one was out and about, except the car ferry and its passengers. We were delighted with our excursion until we hit the traffic on the outskirts of Rouen, but a dinner that included Pigeon Rouennais, a truly marvelous dish, restored delight. At the moment, we are going through nail-biting morning traffic on our way to fly to Crete from Aéroport Charles de Gaulle. ‎This trip to France was far too short. How well do you know Paris? Today we look at the 14th arrondissement. 1. Why does rue Émile-Richard, which runs a respectable 382m, include only one street number? A. Because it crosses a cemetery. B. Because it runs along a railroad track. C. Because it borders the bleak walls of a prison. 2. How many stories in the Montparnasse Tower? 3. In the Montparnasse Cemetery, the grave of the Pigeon family is surmounted by a life-sized bronze sculpture of a scene from the conjugal life of the honorable bourgeois couple. What is the scene? A. The spouses are in their bathroom. B. The spouses are lying side by side in their king-sized bed. C. The spouses are in their living room. 4. What is the ratio of remains contained in the catacombs to current inhabitants of Paris? A. Three times as many skeletons as living Parisians. B. Equal number of Parisians above and below ground. C. Three times fewer skeletons than living Parisians. 5. What is peculiar about the architecture of the Paris Observatory? A. The walls of its laboratories are perfectly round, without interruption. B. Iron and wood were shunned during its construction. C. It rests on oil-filled caissons so that earthquakes don’t skew scientific readings. Answers: 1. A, rue Émile-Richard runs through Montparnasse cemetery; 2. B, 59 floors; 3. B, husband and wife in bed; 4. A, three times more skeletons than living Parisians; 5. B, Iron and wood were shunned in construction. Our next book club meeting is May 15 at 5:30pm at Schuler Books on 28th Street in Grand Rapids and the selection is The Mistress Of Paris: The 19th-Century Courtesan Who Built an Empire on a Secret by Catherine Hewitt, the story of 19th century Parisian courtesan Comtesse Valtesse de la Bigne. For more information contact Marijke Wiersema. How well do you know Paris? Today we look at the 13th arrondissement. 1. How do books at the François Mitterand Library circulate from one tower to another? A. On a conveyor belt. B. Propelled by compressed air in a network of PVC tubes. C. Transported in carriers that glide on rails affixed to the ceiling. 2. In what year was the Biévre river totally covered? 3. What does the name Tolbiac evoke? B. A pigment prized by dyers. 4. What film recounts the true story of a spectacular escape attempt from La Santé Prison? A. La Grande Évasion (The Great Escape). B. La Trou (The Hole). C. La Belle (The Deciding Game). 5. What is peculiar about the rue du Disque? A. It’s an underground road. C. It houses the Museum of the Microgroove at number 3. Answers: 1. C, carriers fixed to the ceiling; 2. A, 1912; 3. A, a victory of the Franks over the Alamans in 496; 4. B, Le Trou; 5. A, entrance to the subterranean road is at 70 avenue d’Ivry. My husband and I are preparing for a trip abroad and our first stop is Rouen, in Normandy, France. Aside from the questions of which footwear and clothing to pack, a question of primary importance is which books to pack (no, I’m not a Kindle user). Michelin's Green and Red Guides always go with us. And of course, something on Rouen's history. Reading about Jeanne d'Arc would be apropos because she was martyred in Rouen's Place de Vieux Marché. And I would certainly profit from re-reading Madame Bovary and A Sentimental Education by Rouen’s native son Gustave Flaubert. I realize I want to add the weight of the present to the weight of history, so I chose The Elegance of the Hedgehog and one of John Banville's latest "Mrs. Osmond" novels for reading before going to sleep. Neither of them are set in Rouen, but both are set in Europe. Don't let me mislead you, though; I spend much more time figuring out which clothing to pack. Our next book club selection for March 20 at Schuler's was is Billie, a story about a unique friendship between two young people. The book was the number one best seller in France by French author Anna Gavalda. For more information please contact Marijke Wiersema. How well do you know Paris? Today we look at the 12th arrondissement. 1. What Luc Besson film contains a scene shot in the gare de Lyon’s Le Train Bleu restaurant? 2. What is the parc de Bercy’s “canyonaustrate”? 3. The group of sculpted figures adorning the center of the place de la Nation is entitled The Triumph of the Republic. What is the feminine figure symbolizing the republic perched on? C. An arc de triomphe. 4. What is the width of the narrowest Parisian way? 5. Where does the name Picpus, used by a road, a boulevard and a cemetery, come from? A. From a property owner whose land the road goes through. B. From an epidemic of itch. C. From a train company that had its headquarters in the quarter. Answers to last week's quiz on the 11th arrondissement: 1. B, associates Richard and Lenoir; 2. A, one vine and live in Paris; 3. B, Jules Verne; 4. A, a chapel painted entirely in a trompe-l’oeil; 5. B, foundations for supports of the guillotine near where the Roquette prison once stood. Answers: 1. B, Nikita; 2. B, water cascades into a naturally formed canyon; 3. B, a ball or globe; 4. B, o.87m wide; 5. B, epidemic of a skin rash. Sunday, March 18, 2018 join the FOTO to see the 2pm matinee performance of Gounod's Faust. Price: FOTO Members: $150 adult/$75 student; non Member: $175 adult / $100 studentPrice includes your ticket to the performance and round-trip bus fare. "An Opera Worth Your Soul" is the title of Barrymore L. Scherer's "Masterpiece" column about Gounod's "Faust" in the March 3-4, 2018 Wall Street Journal. After describing passages of "tender melodies" and "magical interplay of voice and instruments", and how "Gounod's soaring theme returns in the full orchestra", he writes, "It is the opulent melodic warmth and color of this music--together with extroverted numbers like the Kermesse waltz, the soldiers' chorus, and the impassioned final trio--that have enabled "Faust" to endure after a century and a half. " A must see, must hear opera. Act Now – Seating is limited! Reserve your seat today and arrange payment by contacting Peggy Barber at 231-740-8200, or email: trips@fotogr.org. How well do you know Paris? Today we look at the 11th arrondissement. 1. Whose memory doe the metro station Richard-Lenoir evoke? A. A deputy Lenoir, whose first name was Richard. B. Two associates, M. Richard and M. Lenoir. C. A certain Richard, an artist, nicknamed "le Noir" (the black). 2. Any Parisian can, under certain circumstances, join the Association of Winegrowers of Paris. What are the required conditions? A. To have at least one vine and live in Paris. B. To successfully pass an enology exam. C. To prove ownership of a wine cellar anywhere in France. 3. To what 19th century writer do we owe the novel Paris in the 20th Century? 4. What curiosity can be seen on the interior of the église Sainte-Marguerite, on the rue de la Roquette? A. A chapel painted entirely as a trompe-l'oeil. B. A group of contemporary stained glass windows. C. A wax statue of a reclining Sainte-Marguerite. 5. At the intersection of rue de la Roquette and rue de la Croix-Faubin you might notice five paving stones set in the asphalt. What are they? A. Vestiges of Thiers's fortifications. B. Foundation slabs which supported the guillotine. C. Stones from the north tower of the old Bastille prison. Answers to last week's quiz on the 10th arrondissement: 1. B, Éventaillistes who collaborate with artists to care for the "residents" of the musée de l'Éventail at 2 boulevard Strasbourg; 2. B, 9 locks climbing 25m over 4 km between the Seine and La Villette pond; 3. B, the infamous Montfaucon gallows stood not from the lock; 4. A, 1.2m wide and 5m tall; 5. B gare de l'Est. My pick this week is The Streets of Paris: A Guide to the City of Light Following in the Footsteps of Famous Parisians Throughout History by Susan Cahill noted author of the Hidden Gardens of Paris. I know, the title is a mouthful but this is not only fun and informative to read but comes with lots of handy tips and information about not-so-common places to visit. How well do you know Paris? Today we look at the 10th arrondissement. 1. What are artists who make hand fans called?. 2. How many locks are there in the canal Saint-Martin? 3. Why is one of the canal Saint-Martin locks called "the lock of the dead"? A. It is bridged a high gangway popular among those attempting suicide. B. It evokes memories of an old gallows. C. The locks name actually comes from a corruption of the French word for "Moors." 4. How wide is the narrowest building front in Paris, at 39 rue du Château-d'Eau? 5. Which of the following is spanned by the rue de l'Aqueduc? B. The tracks of the gare de l'Est. C. The gardens of the Lariboisière hospital. Answers to last week's quiz on the 9th arrondissement: 1. C, Greek-inspired architecture; 2. A, Anvers; 3. B, crossed by plasterers’s carts; 4. C, one-way traffic; 5. A, Cave of Thieves. Our next book club selection for March 20 at Schuler's is Billie, a story about a unique friendship between two young people. The book was the number one best seller in France by French author Anna Gavalda. For more information please contact Marijke Wiersema. Steve's pick this week is the wonderful 111 Places in Paris that you shouldn't miss (2017) by Sybil Canac, Renée Grimaud and Katia Thomas. Two examples of this well-laid out and informative book are the Chocolate museum in the 10th arr. and the Chen Zen fountain in the 13th. Both are on our list for our next trip in April. Oh, and the book is available at the Grand Rapids Pubic Library, main branch. "The epitome of the bistro dish, this simple pairing of a grilled steak (with various optional sauces) and fries is elevated to serious heights when the meat is well selected and carefully matured, and the potatoes are fresh, hand-cut and double-fried. Order your steak cooked to your liking, from saignant (i.e. rare) to à point to bien cuit (i.e. well done). French chefs typically prefer to serve it saignant, as it is considered the optimal stage at which to enjoy the flavor of the meat. I am personally all about the excellent steak frites served at Bouillon in Pigalle, right in my neighborhood!" How well do you know Paris? Today we look at the 9th arrondissement. 1. Where does the name Nouvelle Athènes quarter come from? A. Paris's first Olympic pool was built there in 1932. B. From its proximity to a theatre called "The New Athens." C. From the architecture of the apartment buildings, inspired by the ancient Greek repertoire. 2. In what metro station was François Truffaut's film Le Dernier Métro partially shot? 3. Why is place Blanche so named? A. Facing directly south, it is always very bright. B. It used to be crossed by plasterers' carts. C. Its real name is Blanche de-Castille, but was shortened in usage. 4. What Parisian speciality first appeared in 1909, simultaneously on the rue de Mogador and the rue de la Chausée-d'Antin? 5. What was the name of the first wax museum, which opened to the public at the end of the 18th century on the boulevard du Temple? A. The Cave of Thieves. Answers to last week's quiz on the 8th arrondissement: 1. A, racetrack; 2. there is no consensus so all are correct; 3. B, wheeled urinals; 4. A & B, there is no bell tower and it is oriented south toward the rue Royale; 5. A, Venetian beach. Office Team, a Robert Half company, is working with a company in Grand Rapids who has an employment opportunity for someone who is fluent in French. If you know of anyone who might be interested, please contact Lauren Naveaux, OfficeTeam Division Director, at lauren.naveaux@officeteam.com, 616.774.9500 or by fax 616.454.4508. Consider this bird. Isn’t it spectacularly ugly? See its blue legs, its lead ring (on the right leg near the body)? It’s a poulet de Bresse, famous for its delicate flavor, and it came to mind again recently when reading that famed chef Paul Bocuse had died in January. He was known for creating many delectable dishes, Volaille de Bresse en Vessie being one of them. This particular bird was cooked by Anne-Lise Whitescarver, cherished member of Alliance Française, to celebrate the Christmas of 2016, and it’s thanks to David Whitescarver that we have this photo to share. 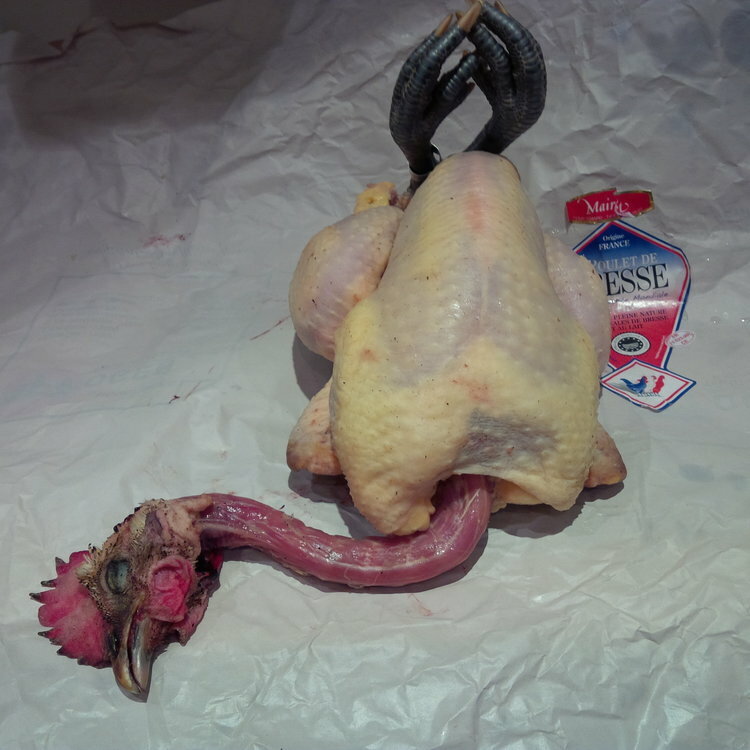 I wonder how many of us have eaten a poulet from the plains of Bresse…. Our next book club selection for March 20 at Schuler's was is Billie, a story about a unique friendship between two young people. The book was the number one best seller in France by French author Anna Gavalda. For more information please contact Marijke Wiersma. Today we look at the 8th arrondissement. 1. What did the Champs-Élysées look like from 1833 to 1860? 2. What are the inhabitants of the Champs-Élysées called? 3. What type of urinals did early 20th century Parisians see appear along the Champs-Élysées? A. Urinals for women called "dalmatiennes." 4. In what way is the Madeleine different form other churches? 5. Where does the cabaret du Lido get its name? A. From a Venetian beach.
. From a Sicilian singer. Spring 2018 class schedule is online! "Paris was the epicenter of art during the latter half of the nineteenth century, luring artists from around the world with its academies, museums, salons, and galleries. 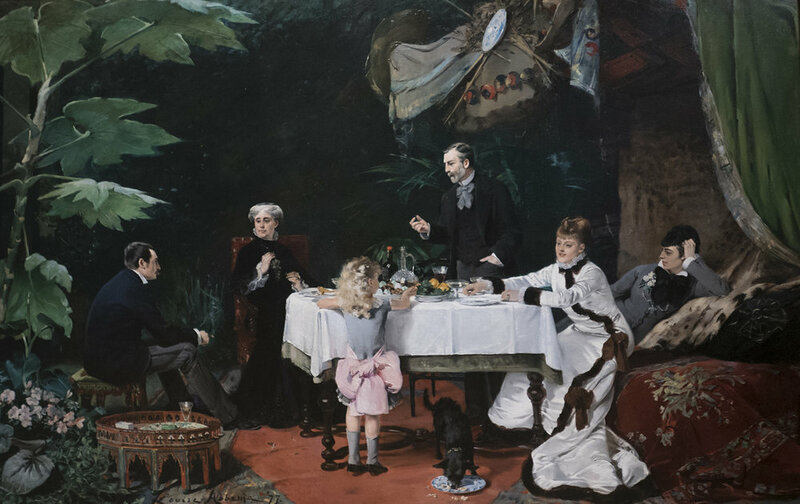 Despite the city’s cosmopolitanism and its cultural stature, Parisian society remained strikingly conservative, particularly with respect to gender. Nonetheless, many women artists chose to work and study in Paris at this time, overcoming immense obstacles to access the city’s resources. 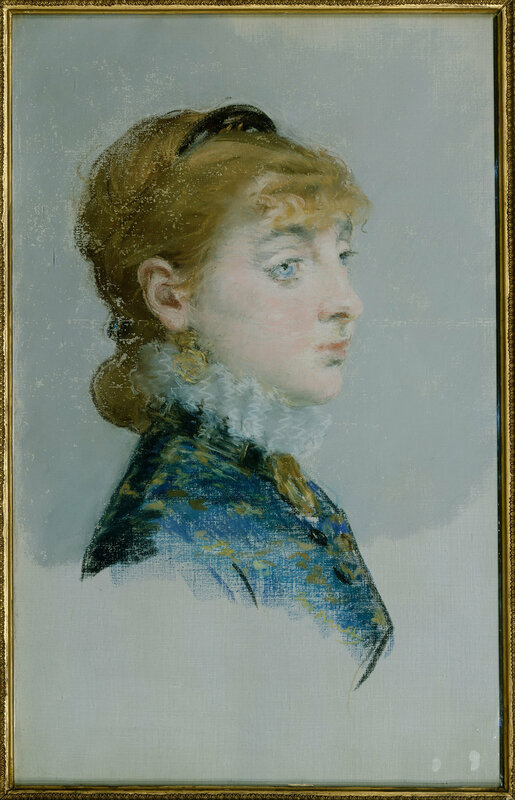 Women Artists in Paris, 1850-1900 showcases the remarkable artistic production of women during this period of great cultural change, revealing the breadth and strength of their creative achievements." Read more. The exhibition recently finished in Denver last month and heads for the Speed Museum in Louisville, KY before ending the tour at the Clark in Williamstown, MA. Reminder: This year's Mardi Gras celebration will be held at 6:30pm on February 13, at the Villas of Ada Clubhouse, 830 Bridge Crest Drive, just off Ada Drive. Today we look at the 7th arrondissement. 1. In 1800 the Parisian sewers essentially consisted of a 20 km network. Over what distance doe their passages run today? 2. What do the collections of the musée de Valetin-Haüy evoke? 3. What animal sculptures greet visitors to the musée d'Orsay? 4. Among the most famous of Rodin's works shown at his museum is the renowned Thinker. Who is he and what is he thinking about? 5. Two steps form the metro Vanneau, a small chapel houses a mummy. Whose? Answers to last week's quiz on the 6th arrondissement: 1. B, 5; 2. A, sculpture; 3. C, a room where one sings; 4. A Benedictine monk 5. B, ice cracking. Une soirée de conversation! Come join us for an evening of French conversation. Beginners through advanced - all are welcome. Wed. Feb. 7 from 6:45 to 8:00 at 1825 Weymouth Dr. SE, Grand Rapids. Wine and a light hors d'oeuvre will be served. Je vous attends! For more information please contact Linda Fitzgerald at linfreniu@juno.com or 616-827-7214. Please RSVP by Tuesday, Feb. 6. Today we look at the 6th arrondissement. 1. How many Académies does the Institut de France house? 2. The Zadkine Museum, on the rue d'Assas, houses of the work of Ossip Zadkine. In what art did he distinguish himself? 3. What does the word "odéon" mean in Greek? 5. What does the fontaine de Québec (situate din the place du Québec) resemble? Today we look at the 5th arrondissement. 1. Who was the first king to make Paris the seat of his kingdom? 2. What artist is responsible for the sundial inlaid in the wall of 27 rue Saint-Jacques? 3. Who is the patron saint of Paris? 4. What were the "moffettes" whose memory the rue Mouffetard evokes? 5. What metro station evokes a mathematician who created descriptive geometry? Answers to last week's quiz on the 4th arrondissement: 1. B; 2. C, Hugo lived at no. 6; 3. A, it’s barely 2m wide; 4. C; 5. C, 500. Stories from Paris cemeteries. . . Reminder: This year's Mardi Gras celebration will be held at 6:30pm on February 13, at the Villas of Ada Clubhouse, 830 Bridge Crest Drive, just off Ada Drive. Oh, and don't forget about Book club this coming Tuesday, January 23, at Schuler's, 5:30-6:30. Today we look at the 4th arrondissement. 1. What was the name of the department store opened in 1824 by Pierre Parissot on the quai aux Fleurs? 2. What famous renter lived at 21 places des Vosges? 3. What is unique about rue de Venise? 4. What types of prisoners were housed in the Bastille? 5. The île de la Cité currently has about twenty roads. How many were there before it was completely redrafted by Haussmann? 1. B; 2. B; 3. B; 4. C; 5. C.
Today we look at the 3rd arrondissement. 1. What is a "rambuteau"? 2. What is the construction date of the oldest house in Paris, situated at 51 rue de Montmorency? 3. What is the specialty of the musée Cognaq-Jay, located in the hôtel de Donon? A. The history of wireless communication. B. The decorative art of the 18th century.
. The history of medieval Paris. 4. Who are the "Filles du Calvaire" that figure on the street signs of the boulevard that forms the border of the 11th arrondissement? 5. What letter writer lived in a hôtel that she called her "carnavalette" (little carnival)? A. The comtesse de Ségur.
. The marquise de Sévigné. Answers to last week's quiz on the 2nd arrondissement: 1, C, there were 12 courts in all; 2, all three are correct; 3, C; 4, B; 5, B false, it originated in England. This year's Mardi Gras celebration will be held at 6:30pm on February 13, at the Villas of Ada Clubhouse, 830 Bridge Crest Drive, just off Ada Drive. This week's quiz focuses on the 2nd arrondissement. 1. The place du Caire is located on the site of the old cour des Miracles (the court of Miracles) Where does the name of this famous court come from? A. St. Louis performed miraculous healings at the spot. B. Small shows called "miracles" were performed there for the passerby. C. It was a meeting place of beggars who faked being maimed. 2. What is unique about the rue de Degrés? A. There are no doorways along its sides. B. It is the shortest in Paris. C. It's in the form of stairs. 3. What is the longest covered arcade in the capital? A. The passage des Panoramas. B. The passage du Grand-Cer. C. The passage du Caire. 4. At no. 13 galerie Vivienne lived Vidocq, who was. . .
A. a detective in the service of the emperor. B. a convict who became the chief of police. C. a policeman who became a gentleman bandit, head of a band of policemen robbers. 5. The croque-monsieur, a dish on the menu of every Parisian brasserie, was born in the 2nd arrondissement. True or false? Answers for last's week's quiz on the 1st arrondissement: 1, A, the Austrian Campaign; 2, C, octagonal; 3, A, midnight blue ceilings; 4, A, Philippe Auguste; and 5, circular road. Incredibly insightful this wonderful essay is not as depressing as it sounds, and in fact it's quite upbeat. The focus on the impact of Impressionism on one's spirit is elevating and illuminating. "Paris is a good place to mourn. I would say this even if my uncle Richard hadn’t lived there, but all the more so that he had." The upcoming AF Grand Rapids Mardi Gras party is scheduled for February 13 (Fat Tuesday) -- more details next week! Last call for Winter French Class registrations so if you're looking to bone up on your language skills, head on over to the French Classes page. 1. What do the bas-reliefs on the Vendôme Column depict? 2. What shape is the Tuileries pool closest to the place de la Concorde? 3. What décor adorns the ceilings of Sainte-Chapelle? A. A midnight blue sky sprinkled with golden stars. B. A fresco showing God on a cloud, surrounded by angels flying through a clear sky. C. Scenes from the life of christ. 5. What is unique about the rue de Viarmes? A. It is the only circular road in Paris. B. There are no house numbers on the fronts of the houses along it. C. It is the oldest paved road in Paris. On 10 June 1944, the village of Oradour-sur-Glane in Haute-Vienne in Nazi-occupied France was destroyed, and all of its 642 inhabitants, including women and children, were massacred by a German Waffen-SS company. A new village was built nearby after the war, but French president Charles de Gaulle ordered the original maintained as a permanent memorial and museum. Incredibly powerful and poignant. . .
Last year we visited our niece Christina and her family living in the city center and it was a wonderful experience. The two of us took the train directly from Charles de Gaulle airport to Lille where we were met by our niece and her children. Life is short. Go to France. Local Grand Rapids restaurant going for a Parisian brasserie theme. Recently four of us had dinner at the New Hotel Mertens on Oakes Street in downtown Grand Rapids. The ambience was quite French but it was far too loud, which made us recall that brasseries in France that we've experienced aren't really loud at all. Anyway, the food was mostly quite scrumptious -- deviled eggs and roasted marrow bones for starters were a hit. For our plats two of us had the steak frites which were perfectly prepared, very tender and rounded out nicely with hand-cut frites and a small green salad. One had coq au vin which, while very flavorful, was presented as a chicken leg and thigh with a few small vegetables, not typical of the usual preparation. Our fourth had the choucroute, an Alsatian dish which was done just to his liking. For dessert we shared the individualized croquembouche, which was a mess. It was toppling over, the overdone caramel was like concrete and attempting to pry the profiteroles apart required specialized tools. The pastry chef in our midst noted that the choux puffs were dry and the vanilla pastry cream lacked a luscious creaminess. The wine list is very thin -- almost as thin as the red burgundy we sent back - and a disproportionate number of bottles were pretty pricey. The food experience was truly all over the place but the willingness of the staff to forgive the dessert was appreciated. I would be willing to return and give them another try. Be aware that parking is only available on the street or in nearby ramps and lots. Cost is typically $10 for the evening. Finally, a few postcards from Paris during the Belle Epoque -- compliments of the U.S. Library of Congress. 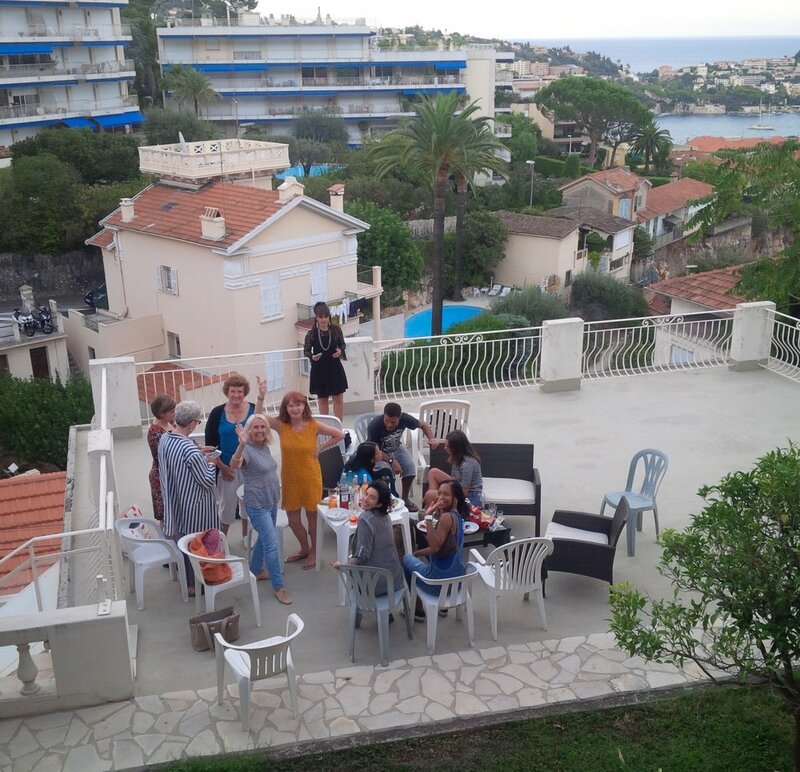 So, I'm sitting down to write about how a French immersion course in France might be your perfect holiday gift, when I'm alerted that France magazine mentions such a course offered in Villefranche-sur-Mer. I attended that course the September before last! Incredible, n'est-ce pas? This course is offered at L'Institut de Français, situated about a half-hour taxi ride east from the Nice airport, in Villefranche-sur-Mer. The school occupies an attractive villa, with a walled, terraced garden in which one can stand under a bougainvillea-draped arbor and look out over the shimmering Mediterranean sea and the green, terra-cotta-roofs dotted Saint-Jean-Cap-Ferrat. Quite a beautiful, historic surrounding. But the French immersion school experience comes down to adapting to one's new environment and learning to converse in French. And that's where one can feel underwater at times. The view from my balcony at dusk. L'Institut is across the street. One wouldn't think immediately about how the differences in energy policy between the US and France would affect one's stay, but a common subject of conversation (en Français, of course) was how uncomfortably hot our apartments were. No air-conditioning in most of them. Worse, because of theft concerns, we were encouraged to keep our window-encompassing metal shutters closed while sleeping. It was each of us and our little oscillating fan. Energy costs are high in France; the resulting discomfort was an adjustment. The month-long, 5-day week classes were challenging and effective. Progress was made, even though we cheated at times, especially in the evenings, when we gathered for an apéritif or dinner and spoke English together. According to an Australian friend there, who has several years of experience with French immersion courses, one progresses faster if one doesn't indulge in that way! To that end she plans next to attend a two-week, relatively small (20 or so students), live-in language school in the Dordogne, where one is expected to speak French day and evening. She also said her favorite French immersion course so far is CREA-Langues, a valuable recommendation, I thought. We all agreed, however, that the very best part of our time at L'Institut de Français was meeting each other. A cliché, I know, but we did get along swimmingly. Friends from Spain, Australia, Brazil, Turkey, Jamaica, the UK and the US. Alliance Française de Grand Rapids - Exploring the Many Facets of France. Yes, the Refresh Your French class is being offered this winter! Class commences Tuesday, January 9. No, the Converse in French class (formerly known as Intermediate French) is not being offered this winter; however, it will be offered in the spring, beginning Thursday, March 15, as will the Refresh class, beginning March 13. Intermediate level students are most welcome to join the winter Refresh class. For more details, please go to our website www.afgrandrapids.org and click on "French Classes". Hope to see you there. For the January meeting we're reading Paris in the Present Tense, by Mark Helprin. This new novel by a best-selling author is set in present-day Paris. With a 5-star rating from Amazon books, it promises to be an interesting and exciting selection. Join with other AFdeGR members to discuss the book on Tuesday, January 23, 5:30 at Schuler Books Café, 2660 28th Street, SE, Grand Rapids. This Monday evening, December 4, 7:30 p.m., at Fountain Street Church, Grand Valley State University presents music from France, with a large symphony orchestra and choir performing selections including Guillaume Du Fay's "Magnificat", Francis Poulenc's "Gloria" and beloved French holiday carols. Not to be missed.